Remember ClamCase? 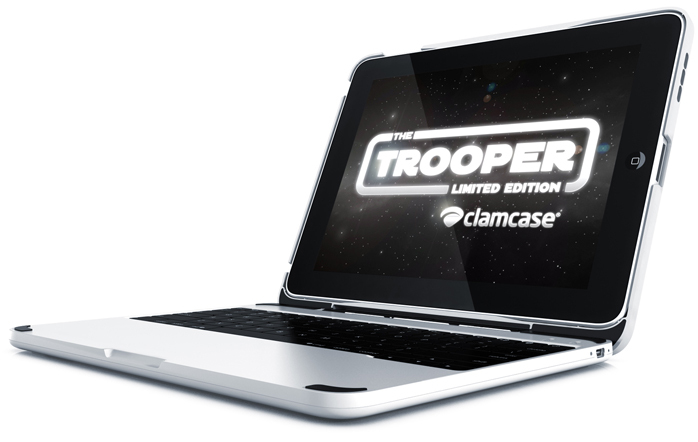 The guys who transformed the iPad into a full fledged portable laptop have now released a new limited edition ClamCase for the iPad and iPad 2 called The Trooper. This Star Wars Storm Trooper inspired full chiclet-style Bluetooth keyboard, protective case and funtional stand is one beautiful piece of high-gloss white epicness of a keyboard case a Star Wars fan always wished for. How much you ask? The Trooper limited edition keyboard case for the iPad and iPad 2 will set you back just $149 and it will be available to order this summer. May the 4th be with you.